You can sponsor one of these pujas for others, for your family, friends, your business partners. Please let us know if you would like us to inform the other party of your gift. Whether for yourself or others, please let us know the purpose of the prayers when making the request. All these pujas are open for sponsorship and offerings received through the pujas are used to support the monks and nuns at the monastery. Your continued support for this very worthwhile cause is deeply appreciated and as an expression of their gratitude the monks and nuns additionally recite the 21 Tara Praises every day for the long life and health of their benefactors. A puja is a ceremony in which prayers are offered to the Buddhas to request their blessings or invoke their help. Pujas are performed to avert and clear the three types of obstacles, conditions which prevent us from achieving our worldly and spiritual goals. There are three types of obstacles. Worldly obstacles: these are affecting day to day life, relationships, business, finances. Inner obstacles: these affect our health or mental state. Secret obstacles: these obstruct the attainment of innate wisdom. By making extensive prayers and offerings with sincere motivation, unfavorable circumstances that bring problems can be changed. It is said that prayers performed by ordained ones are especially powerful and effective as they are performed on the base of pure morality. Similarly making offering to the assembled sangha during a puja collects extensive merit and purifies obstacles more effectively. for the dying: to help pacify their mind, and decrease fear during the time of death. for the deceased: to bless and guide their mind to a higher state of rebirth and liberation. for sickness: to remove obstacles to mental and physical health. for success in one’s activities: removing obstacles to success of one’s activities, be they worldly or dharma. You can have a special puja performed for yourself, your loved ones and friends, for the success of your business, to accumulate merit, to remove obstacles to health or to assist a person who is sick or dying. If you would like a special puja performed please contact us with the details such as name of the person. the birth date and sign and the problem or situation. We will check with a Lama as to which is the most beneficial puja for your situation, and communicate to you the cost of the offering. If the matter is urgent the puja will be performed immediately. A minimum donation of $100 is requested for the puja services. The Healing Buddha, has promised to help all those who are sick and dying, or experience obstacles in their virtuous activities. He is depicted holding a bowl containing the five kinds of medicines. The puja helps to clear and avert obstacles due to sickness and disease, and to bring success in all activities, dharma and worldly. At the time of death the blessings from Medicine Buddha prevent one from falling into the lower states of rebirth. Those already in a lower state of rebirth will be quickly liberated and will take rebirth in a precious human body. This prayer is recited daily by the monks during morning prayer assembly. This is the bodhisattva’s prayer of aspiration to be able to benefit all sentient beings during the three great events in their lives: birth, death and bardo. King of Prayers is most commonly recited to pacify the mind of those who are ill or dying, and to purify all obstacles to higher rebirth for those who have died. Tara the Wisdom Mother is invoked in times of personal difficulties, family and business problems, and when there is need for quick wisdom action. She manifests in twenty-one different forms to benefit all beings. In the aspect of Cittamani Tara, she responds quickly to the requests those who pray to her. This puja engages Green Tara and all of the healing qualities of the 21 Taras. She is called upon to assist in healing and to remove obstacles of any type and is known as the swift protectress. The Wisdom Mother Tara is invoked in this form to protect all those who request her from harm to their lives. This practice is specially recommended for those who have obstacles to their long live,in the form of illness, but also external danger. Twice every month guru puja is performed by all the monks in celebration of the spiritual master. This puja is quite often recommended as a means to accumulate merit for those who died. It is a comprehensive practice containing the essence of the entire teachings of sutra and tantra. It strengthens the bond with one’s spiritual master and creates the cause for finding ones’ spiritual master again in future lives. It accumulates extensive merit – offerings are made to all the enlightened beings in the form of the merit field, from Shakyamuni Buddha over the linage lamas to the personal spiritual master. A well thought out and affective merit accumulating puja. This special practice is, performed daily in monasteries for the protection of all Dharma practitioners and Dharma places from all external and internal obstacles to Dharma practice. This puja is performed to remove all obstacles to the long life. Namgyalma is one of the three Long life Deities (white Tara, Amitayus, Namgyalma) Making requests to these deities helps to remove obstacles to one’s lifespan (for example accidents, possibly fatal illness, as well as improve the quality of ones life. During this puja extensive offerings are made to accumulate merit and to purify all the hindrances to one’s long life. It has long been a practice in Tibet to have tsa tsas made to accumulate merit, to remove obstacles from one path in life and also made and for those who are ill and made and dedicated for the deceased. The Tanaduk clinic now offers this service for practitioners, lay people and their pets. What Is a Tsa Tsa? ‘Tsa Tsa’ is a Tibetan term used to describe Buddha statues and relief images that are made as part of a particular meditation practice. Making tsa tsas is a preliminary practice given by teachers in Tibet – and now all over the world – to their students as a method of eliminating obstacles, purifying negativities, and creating positive energy (merit). Often, students are given a commitment to make 100,000 tsa tsas during their lifetime. 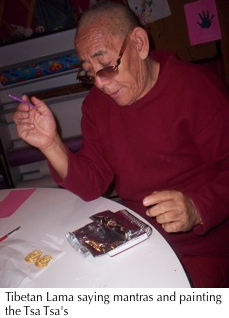 All Tibetan Lama’s have done this and continue to do this special practice. Traditionally in Tibet, tsa tsas were made with clay from the earth, left to harden, and placed on altars, shrines or in other holy places. These days, more modern and durable materials are used, such as plaster, hydrostone, or the professional casting system used at the Tsa Tsa Studio, which consists of architectural-grade gypsum and other materials. All of the tsa tsas available through Tsa Tsa Studio are made by practitioners using all of the prayers, mantras and blessed materials associated with tsa tsa practice. According to the refuge vows taken by Buddhists, we should not think that we are “selling” Buddha images, as they are objects intended to lead us along the path to enlightenment and are therefore sacred. Instead, we set a suggested amount based on the amount of materials and other costs. We request that those who receive our tsa tsas also see them as holy objects for which they are making a suitable donation. All proceeds go towards supporting the activities of Tsa Tsa Studio. A note on our colors: “Gold” and “Pearl” colors. The tsa tsas are painted with very fine luminescent gold and pearlescent paints, respectively. Orders within the US: Please order online by clicking the Add to Cart button next to each image. You may also send a check for the total. Contact us for that information. Orders outside of the U.S.: Customers outside of the US can also order online but may need to pay extra shipping costs for international shipping. Friends and relatives of those who are ill can request tsa tsa’s be made on behalf of the person who is ill and the person who is ill can also make the request. Tsa tsa’s are also made for family members referred to as pets. The trained practitioner making the tsa tsa’s will perform all of the meditations and mantras done as part of the traditional Tibetan tsa tsa practice on behalf of the person who is ill, and will dedicate them specifically for that person or pet. Those who are requesting this service are welcome to write their own dedication prayers, which will be recited by the practitioner during tsa tsa practice. The Tsa Tsa’s most commonly made for those who are ill or deceased is that of Medicine Buddha, Green Tara and White Tara. As many of the Tsa Tsa’s as one likes can be requested. In Tibet, a portion of the ashes or other remains (such as hair) of a person who has passed away are often enshrined in Tsa tsa’s and also statues, a practice that is said to be very beneficial for the deceased person’s mind and spirit. The Tanaduk offers this service. A portion of the remains, about 1 to 2 tablespoons of ashes or hair are needed and can be placed inside a number of tsa tsa and all of the meditations, mantras and dedications done during tsa tsa practice are performed specifically for the deceased. Those who are requesting this service are welcome to write their own dedication prayers, which will be recited by the practitioner during the tsa tsa practice. Tsa tsa’s fall into different categories in accordance with ingredients added, ash tsa tsa, which has ashes of deceased relative or friend added to bring an unending flow of blessings to them; medicine tsa tsa, which has Tibetan herbs added to also increase flow of blessings to them and increase health and remove obstacles for the deceased future lives. Made with an opalescent color and is one and three quarters inches by two inches. The actual Holy Tsa Tsa item is not being offered for sale. A donation is requested for the time and materials that went into making the Tsa Tsa. Made with a simmering metallic Gold color and is one and three quarters inches by two inches. To request services for yourself or a loved one who needs help in life or is ill or has passed away, please email us at info@tibetandoctors.com (our preferred method) with your request for prayers, puja;s or Tsa Tsa’s, giving full instructions for how many Tsa Tsa’s and which Tsa Tsa’s, Prayers or Puja’s you have selected. Please include for whom, specific dedication prayers you would like added (if any). Blessings Upon All That You Do!